The new Olympc minifigs look great in this amazing scene, however my favourite aspect has to be the synchronised swimmers! There are a variety of viewpoints to enjoy on his Flickr stream, plus I highly recommend his Gerry Anderson Thunderbirds Lego creations. And for those of you wanting to see this up close and personal The Olympic Pool can be seen in the Westfield Stratford Lego Store in London. Gary is a member of the Brickish Association (UK Adult Fan of Lego user group). Lego’s Architecture sets seem to be coming in rapid succession lately, with the Sydney Opera House announced just back in February. Now Lego has announced their latest set, 21013 Big Ben, giving some well-deserved microscale attention to a famous landmark previously only seen in the cartoonized world of Cars 2. 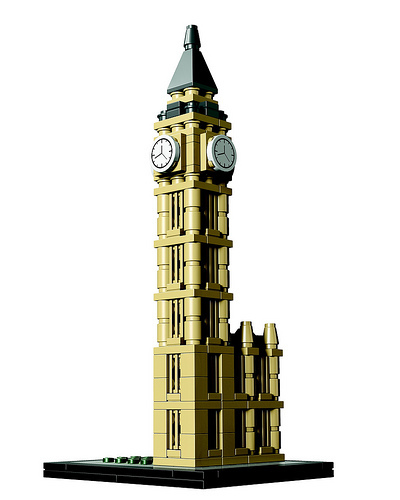 Big Ben, one of the UK’s most recognizable buildings and a global symbol of Victorian London and the Gothic Revival style, has been recreated as the latest set in the LEGO® Architecture series. Big Ben, officially known as the Clock Tower, has stood at the north-eastern corner of the Palace of Westminster in London for more than 150 years. It was designed by the unlikely team of Classical architect Charles Barry and Gothic Revival pioneer Augustus Pugin and completed in 1859. Big Ben is the fourteenth model in the LEGO Architecture range, which uses the LEGO brick to interpret the designs of iconic architecture around the world. It is the first model to be designed by Rok Zgalin Kobe from Slovenia who joins Adam Reed-Tucker as a LEGO architect. “The most challenging in creating this model was representing the richness of 19th century Gothic Revival architecture in a scale usually more appropriate for modern or contemporary architecture of smooth surfaces and clean lines,” said Rok Zgalin Kobe. Charles Barry won the competition to build the new Palace of Westminster in January 1836. His initial designs were without the clock tower that would become known as Big Ben. As his own style was more Classical than the increasingly popular Gothic Revival, Barry asked for assistance from Augustus Pugin, a leading light of the movement that left its indelible mark on the Victorian era around the world. The design of the interior of the palace and the clock tower are thought to be his work. LEGO Architecture products features well-known buildings, and the work of important architects Aimed at inspiring future architects, engineers and designers as well as architecture fans around the world, the range contains a booklet featuring step-by-step building instructions that is prefaced by exclusive, archival history, information and photographs of each iconic building, its design origin, its architect and its architectural features. The LEGO 21013 Big Ben is available for purchase from June 1 in LEGO brand retail stores, LEGOLAND Stores and online at http://shop.lego.com/. The product is designed for ages 12+ and includes a booklet with facts and history about Big Ben. Recommended retail price is $29.99 or €29.99. 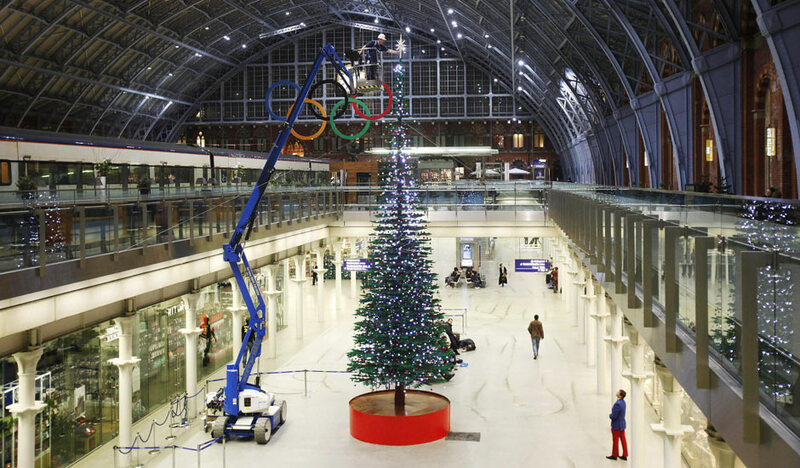 LEGO Certified Professional Duncan Titmarsh of Bright Bricks (who was also involved in building James May’s LEGO house) recently led a project to create what is likely the world’s tallest LEGO Christmas tree at London’s St. Pancras train station. Standing 38 feet (12 m) tall and built from 600,000 bricks, you can see the tree in person on the lower concourse at St. Pancras through January 2. Thanks to all the readers who sent us links about this. Update: Lots more pictures on The Verge. I’m finding it difficult to pick my favorite shot for this blog, because the Liberty Inn by ZCerberus is just lovely. Every angle has something visually captivating. I picked one to put here, but I whole-heartedly recommend perusing the flickr gallery. Thanks for the tip, Walt! Even though we Americans threw off the shackles of monarchy more than 200 years ago, we still find something fascinating in the pomp of a royal event, like the wedding between Prince William and Kate Middleton today tomorrow in London. 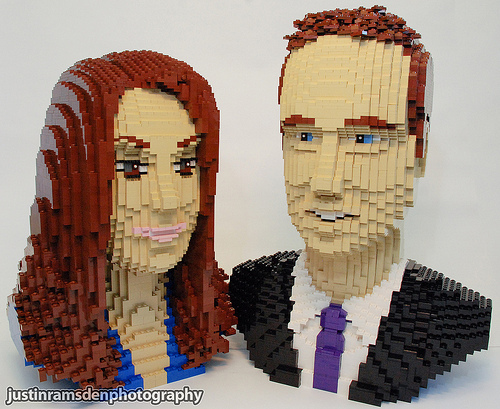 Justin Ramsden made a name for himself with his Amy Winehouse sculpture last year, and even got a job as the youngest-ever Model Maker at Legoland Windsor as a result. His latest sculpture honors the wedding couple. We just got permission from LEGO to publish this a little early. 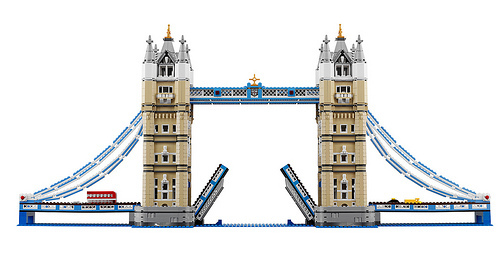 Tonight, at BrickFair, LEGO will officially unveil their latest exclusive set, 10214 Tower Bridge! 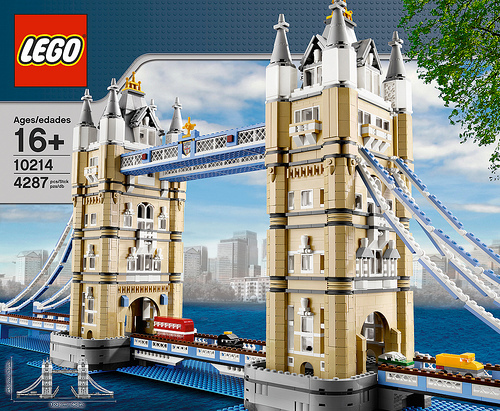 Build London’s famous Tower Bridge! Stretching over the River Thames since 1894, the famous Tower Bridge of London, England is one of the most recognizable landmarks in the world. 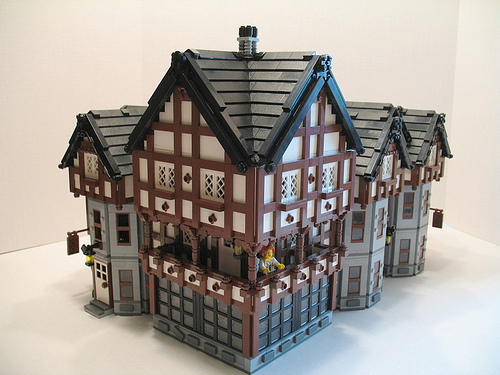 Now you can add this timeless classic to your LEGO world buildings collection! Designed with advanced building techniques and rare colors and elements, the Tower Bridge is complete with its iconic paired towers and a drawbridge that really opens. Fun to build and display, it locks together solidly but can be taken apart in sections for easy transport. 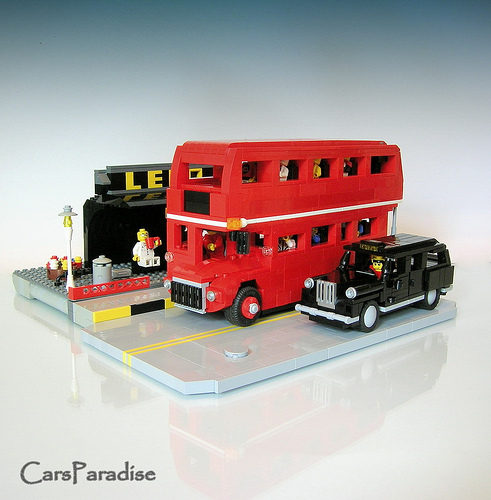 Includes 4 miniature vehicles; a black London taxi, a traditional red double-decker bus, a yellow truck and a green automobile. Completed model measures 40″ (102 cm) long, 17″ (45 cm) high and 10″ (26 cm) wide. 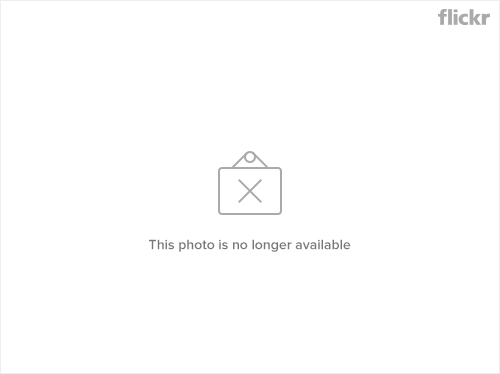 Features hundreds of 1×1 slopes in tan! Tower Bridge is ideal for building and display – it can be taken apart in sections for easy transport! Completed model measures an impressive 40″ (102 cm) long, 17″ (45 cm) high and 10″ (26 cm) wide. 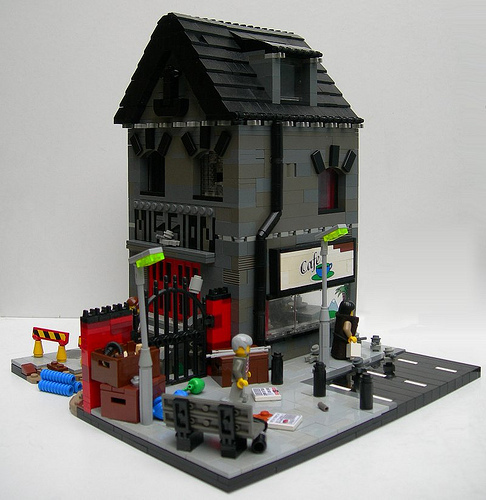 Last month‘s challenge over at Lugnuts has, as always, yielded some amazing builds. Peter Blackert‘s Austin FX4 London Black Cab caught my eye in particular. I’ll be right honest — I thought it was a hearse. Seeing it’s something different doesn’t phase me in the least, though. I won’t deny the sleek styling and fantastic lines! It seems that most of the buses we blog are variants of the iconic London Bus (the Routemaster). Today I’d like to introduce you to the more modern buses seen in Europe. Both make excellent use of the new windscreen piece. 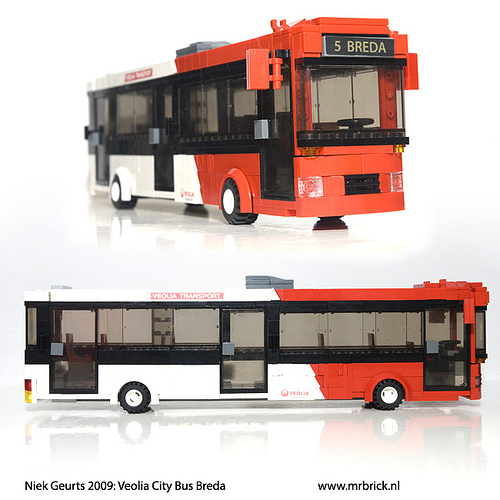 This bus by Nieks (mrbrick) runs in Breda, the Netherlands. While this one by MasterChief1 is a common site in many English towns and cities. I do have to send the purists a warning that there is some use of double sided tape here. I’m pretty sure we’ve blogged this before. OK so we’ve kind of blogged it before but Ralph Savelsberg (madphysicist) has given Firas’ scene a redux for the latest LUGNUTs challenge. This is truly the best Routemaster I’ve seen at minifig scale. For once I don’t have to rack my brain trying to think of a relevant song. Barney Main (SlyOwl) has already done it for me by basing a diorama on Ralph McTell’s song Streets of London. Be sure to click through the pictures in order to match the song lyrics to the diorama. Esben Kolind introduces non-Londoners to the London Overground. Yes, you read that right. 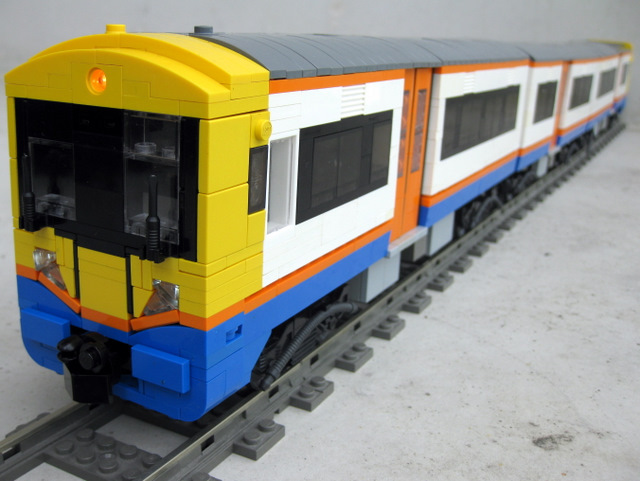 It’s the Bombardier train for the new overground lines built and being built around London. Very slick work on the lights which actually work. Another entry for the Train-Tech Building Contest. 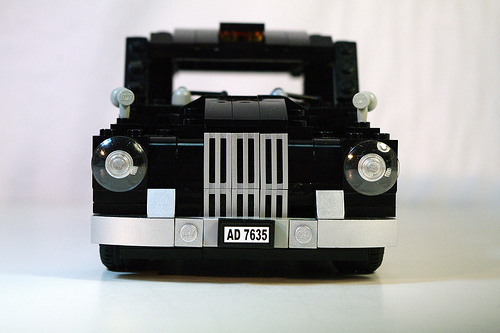 Firas Abu-Jaber (Flickr) is perhaps best known for his larger-scale cars and trucks, but with this set of vehicles inspired by the buses and taxis you can still see on London streets, Firas shows that he’s a master of LEGO vehicles at any scale. 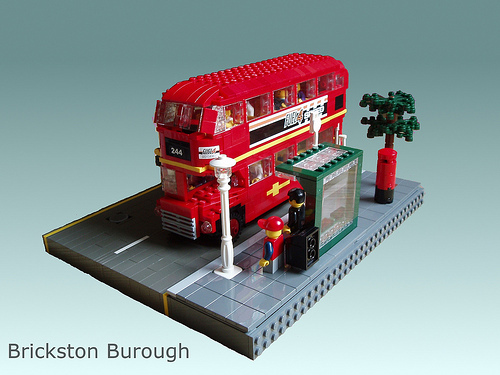 See more pictures of the Routemaster bus and London cab on MOCpages or Flickr.